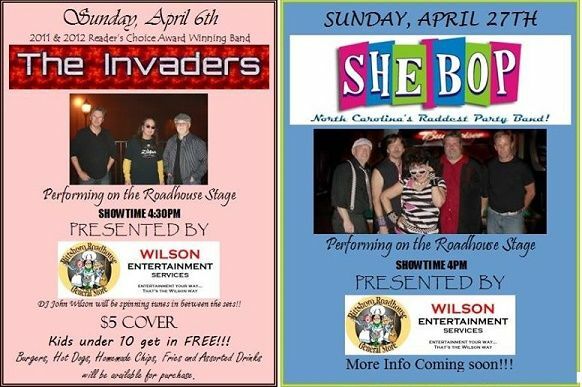 Sunday April 6, 2014 at 4:00 the first event in a new series of Sunday evening band performances on the Pittsboro Roadhouse stage starts with the performance of The Invaders, the award-winning rock & roll band from Winston-Salem. 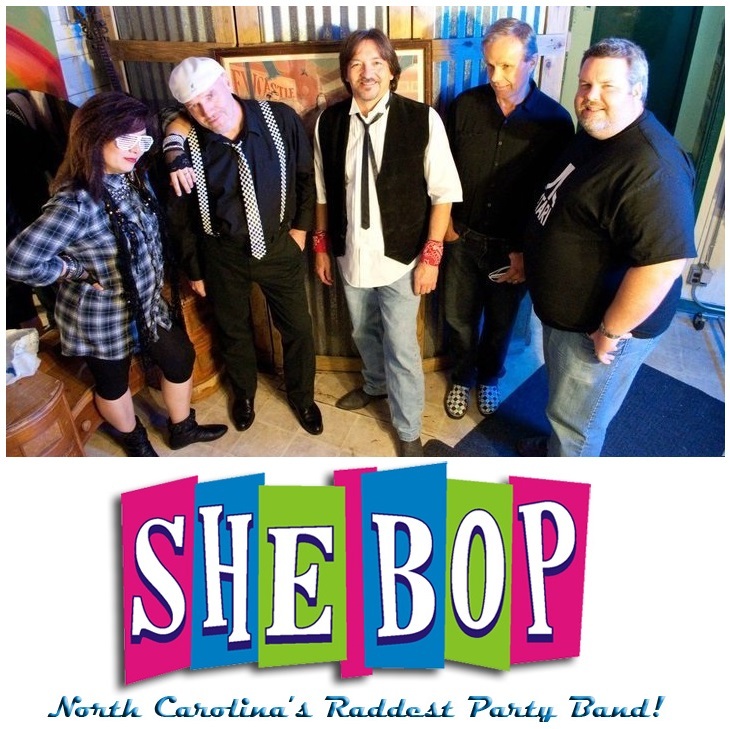 Sunday April 27 at 4:00 SHE BOP the eighties party band performs. Sunday May 18 one of Carolina Beach Music Hall of Fame's newest Inductees, The Castaways, will perform, and The Holiday Band performs Sunday June 22; both play Dance, Funk, Classic Rock, Soul & Country. PITTSBORO, N.C. - March 31, 2014 - PRLog -- A new Sunday band series begins in historic downtown Pittsboro the month of April 2014. 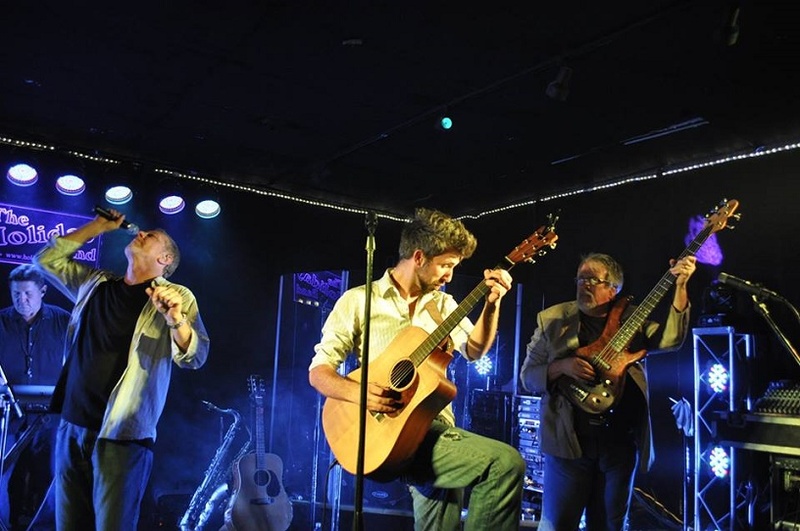 Award-winning bands will be performing on the Pittsboro Roadhouse stage at 39 West Street, Pittsboro, North Carolina at family-friendly events. The first band is the rock band The Invaders from Winston-Salem. Doors open: 4:00. Showtime: 4:30 - 8:30. Cover: $5. Kids ten and under are free. Food: Hot dogs, hamburgers, chips and fries, and drinks will be available to purchase. John Wilson of Wilson Entertainment Services is also a vocalist, guitarist and songwriter for Chatham County's award-nominated BigTime Party Band. Wilson is organizing the Sunday Band Series in partnership with Greg Lewis of the Pittsboro Roadhouse. The Invaders, the band performing April 6, won the 2011 and 2012 Best Local Band in the Winston Salem Readers Choice Awards. The Invaders play Rock & Roll, Classic Rock, Southern Rock, Beach, Blues, Boogies, Soul and some Country. 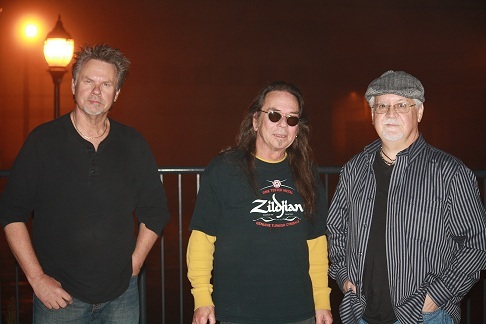 Len Wilson is on guitar and vocals; Jim Fulp on bass and vocals; and Bryant Bowles on drums and vocals. Though the musicians have many years of experience, they began playing as The Invaders in June 2010. The bands will perform at the Pittsboro Roadhouse, one of the area's largest restaurant and music venues, in the rear where the stage, dance floor, and bar are located. http://www.pittsbororoadhouse.com There is also a lounge from which one can see the stage and hear the music. Guests on the patio can also hear the bands. "39 West Street used to be a car dealership," said Lewis. "There used to be a garage where the lounge is now. We installed a screened wall (and door), so when the weather is good, we raise the garage door, and fresh air and music move freely through the screened wall." "No other place within 30 miles of here has the caliber of food, environment and entertainment that the Pittsboro Roadhouse has - it's entirely unique," says Wilson. Within 10 days Hoffman performed acoustic analytics then designed, constructed, installed and tested a major upgrade. "I was able to put together a sound system specifically designed for the acoustics of this room," said Hoffman. "We have a very good representation of the entire frequency spectrum, and it's well equalized. Just about everyone I've talked to - performers and guests have loved the difference." Four bands have been scheduled for the Sunday Band Series. The cover varies with the band fees. Kids ten and under are free. Hot dogs, hamburgers, chips and fries and drinks will be available for purchase. "The shared vision that Greg and I have for Pittsboro," Wilson said, "and I know others see it too, is for Pittsboro's already strong music offerings to continue to grow and develop in a way that Pittsboro becomes known as an exciting music hub. We want to be attracting people from all over the Triangle and Triad and beyond. Pittsboro and Chatham County are already a draw for art and antiques, and of course Shakori Hills Grassroots Festival of Music and Dance in April and October." "If people come to The Invaders, and SHE BOP, The Castaways and The Holiday Band, and they have a good time, and this grows, we'll be able to keep doing the Sunday Band Series and bring even bigger bands to town," Wilson said. Greg Lewis, owner of the Pittsboro Roadhouse added, "This opportunity to do a Sunday Band Series is happening at the right time. Spring is coming. Our sound system is at a whole new level of quality. The Pittsboro music scene is growing and attracting attention, and we're ready to start utilizing our space more; the back part of our restaurant is essentially a music and dance hall. We want to be known as the place to come for really good food, really good music and a really good time!" "The Bass Mountain Boogie, 'Boogie' for short, is three days of Party Bands!" Wilson said. "It's a new festival, in its first year, but it is taking place on the same grounds where the thirty-year-running Little John's Bluegrass Festival is held, the Cane Creek Campground in Snow Camp, NC." 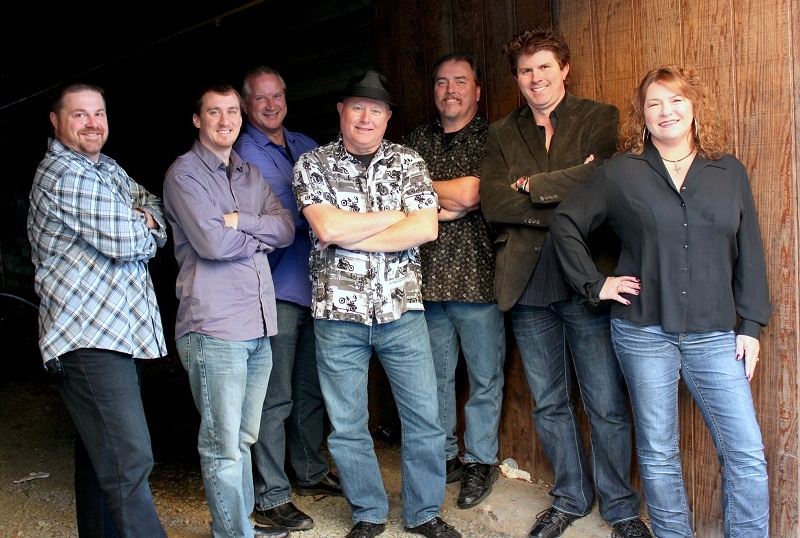 The Boogie will have noted bands performing, including the three mentioned above, Nantucket, The Embers featuring Craig Woolard, Jim Quick & Coastline, Hip Pocket and the Megan Doss Band among others. The drive time to the Cane Creek Campground in Snow Creek NC is 20 minutes from Siler City, about 30 minutes from Mebane, Pittsboro, Carrboro and Chapel Hill; 50 minutes from Apex, Durham and Sanford; an hour from Cary and longer from Raleigh. For more information on the Sunday Band Series contact John L. Wilson of Wilson Entertainment Services at 919-542-3850 or at wilsonmusic2@embarqmail.com. For more information about the Pittsboro Roadhouse and event scheduling contact Greg Lewis at 919-542-2432 or at greg@pittsbororoadhouse.com. The Pittsboro Roadhouse & General Store opened on August 17, 2012 in the space known previously as the General Store Cafe. Local owner Greg Lewis and his family completed significant work updating the restaurant and began the process of establishing a sustainable enterprise that strengthens the community, is a cultural and social center, and becomes a major draw for the town of Pittsboro and Chatham County. Under the leadership of fine-dining chef, Chef David Carlin, the menu features fresh, high-quality ingredients, cooked from scratch with a team he personally hired and trained. Chef David trained in fine dining at one of only two Relais & Chateaux hotels in this state, Westglow Resort & Spa in Bowling Rock North Carolina; the other being Fearrington House, Country Inn and Restaurant. The Pittsboro Roadhouse features local and seasonal ingredients in weekly specials. "The Roadhouse," as it is sometimes called, also has a general store with local art, pottery and jewelry. The Roadhouse is open Monday through Saturday at 11:00 a.m. On Pittsboro First Sundays March - December, the Roadhouse opens for Sunday Brunch between 10:30 - 3:00. The Roadhouse is known for its extensive music calendar featuring live music Tuesday through Saturday nights. Monday nights feature dancing. First Mondays at 7:00 p.m. the NC Revelers, a big band orchestra plays dance music. Line dancing is featured most other Monday nights also at 7:00 p.m. Shag dancing with the Chatham Area Shag Association happens most First Sundays at 4:00 p.m. for a small fee. For more information visit our website.